Contest For Our Kayakers: Show Us Your Rigs! It's a Field and Stream 12' Eagle Talon. Sometimes she carries the milk crate, sometimes the rod rack. Hobie Revo & all I carry is my surf belt & 2 tiny Aqua skinz bags, with stringer. Plus a pump & Paddle. 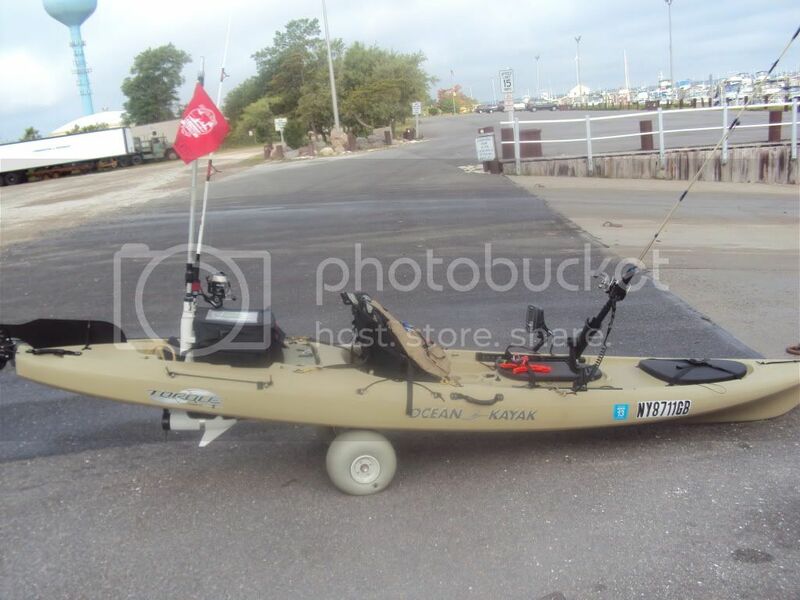 Hobie Pro Angler, with dual rear RAM rod holders, forward Scotty rod holder, Yakattack flag, Lowrance color sonar, Garmin color GPS, neodymium magnet gear-holders, anchor trolley, game clips, leashes for everything etc., etc. wow nice rigs guys. keep em coming! BTW, I will draw for this on Wednesday next week. Thanks! I fish off of my Hobie revolution and absolutely love it. This is when I first got it, so its missing some gear and extra rod holders. I love this stuff, and I've given it a lot of thought. 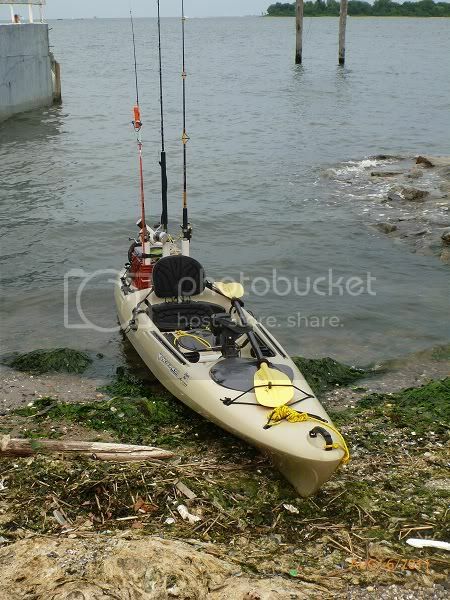 The biggest advantage of a kayak for fishing is its versatility. Anywhere a fish can go... I need to be able to go. With that in mind, I tried to maintain symmetry with my lay-out. I like all my fishing "information" (GPS map, compass, water depth, water temp)to be in one spot, right in front of me. It is very important that I can take a fish from whatever side, or end, he comes to. For that reason, I store my rods in a nearly horizontal position. 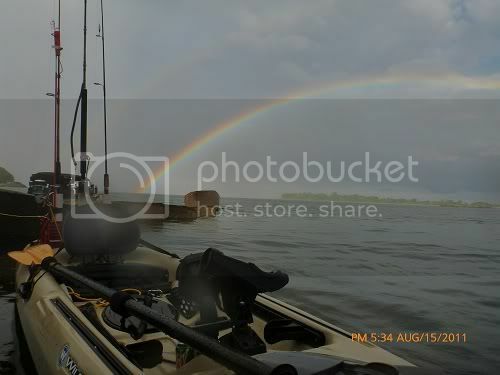 I can get my rod tip (7' poles) 360 degrees around my kayak. The halogen light on the bow is more to be seen than to see. That, my fishfinder, and an internal bilge pump are all run off a rechargeable 7amp dry cell battery. The GPS is a portable handheld that is waterproof and floats.My pole light was made with an LED and an old bike flag pole. It's flexible and won't prevent me from bringing my rod tip around the back of the kayak. My anchor buoy has an internal LED, so I can release from it quickly to pursue a fish, then reclaim my spot afterward!The only things I leash are the GPS and my paddle. I kept the same lay-out with my new hull, also an Adventure, except that I cut a hatch into the storage section behind the seat. It was a large internal space that was essentially inaccessible. It has a clear lid, so I can actually look inside my hull to see if I'm taking on water. I mounted my transducer directly under this hatch, so I can make repairs out on the water, if need be. I actually had to do just that recently when my depth recorder wasn't working. 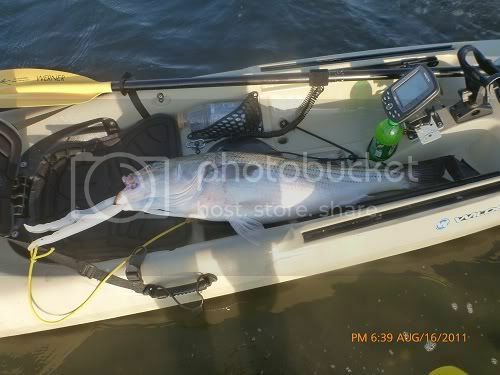 The transducer had gotten knocked crooked, but I could just reach back and adjust it.Even with all of this stuff, I still believe that "less is more" when it comes to kayak fishing. I love the "washing/mojo" thing! I totally get it. Like battle scars from rough landings, it tells a story. Not my whole kayak, but me , my yak, a teen size bass and a blue at J-bay. I have a Hobie Outback, great yak. We don't have any of the serious rigs posted here. We use just use our regular Mainstream, Pelican and Keowee 's. They have to serve multi purposes, from fishing here to running rivers all over the North East. My two boys, Kane & Hogan, ( 12 & 10 ) on a recent successful striper trip. Ohhh... It's Killin' Me ! Pamlico sit in 14 footer with outrigger and all the fixins.